So long, and thanks for all the memes! Last night, Australia’s Prime Minister Toby Abbott, he of the infamous ‘budgie smugglers’ (NSFW), onion-botherer and international laughing-stock was firmly ousted in a leadership spill by communications minister Malcolm Turnbull. Turnbull won the ballot 54-44, securing his position as leader of the Liberal Party and the country. Abbott and Turnbull have long been rivals; Abbott snatched leadership of the party from Turnbull by a single vote in 2009. A spill motion was tabled in a Liberal Party meeting earlier this year, but did not pass. Speculation about a coup has been rife this year, and it was no secret that Turnbull has had his eyes on the top job. Achievements, hmm? Can’t think of many. Anyone? Bueller? Instead what we got from one of the most polarising PMs in recent times was an astonishing back-flip on election promises and an overarching theme of screwing over the people who could least afford it. Abbott used his first budget to – among other things – introduce new taxes, cut funding to hospitals, pensions and the national broadcasters ABC and SBS. The website Tracking Abbott’s Wreckage systematically documents his myriad misdeeds. The consensus among my cohorts is that Abbott’s term in office feels much longer than it actually was, and that he will not be missed. Abbott has done a great deal to damage Australia’s international reputation, not least in the area of climate change, where our climate policy did not extend beyond 2020, and Abbott actively moved to prevent investment in renewable energy. So, off Tony goes into the night, with his massive pension. Good riddance. Not that we’ve had a change in government, merely prime minister. Malcolm Turnbull is a stalwart of the Liberal Party, albeit of a more libertarian bent, so while his reign promises to be more reasonable than the far-right Abbott, I predict we’ll see much of the same, policy-wise. Turnbull is a former lawyer, investment banker and internet entrepreneur. He is very much more popular with the electorate than Abbot ever was, and while he paid lip service to bipartisanship on certain issues in the past, it remains to be seen if he can shift the LNP away from the perennial opposition mode of the past few years. Personally I abhor Turnbull for his destruction of the visionary National Broadband Network, Australia’s largest-ever infrastructure project, designed to bring Fibre To The Home (FTTH) to 93% of Australians. Rather than admit that the Labor government did the right thing to improve our woeful broadband, Turnbull installed cronies of his onto the board of NBNCo, the government business enterprise (similar to a Quango in the UK) and used them to change course towards a so-called ‘Multi-Technology Mix’ or MTM, which utilises our decades-old rotting copper to provide a marginal speed improvement at massive cost ($56bn+). The NBN/MTM is a topic I could go on about for days, and I will probably make it the subject of future articles. It’s a classic example of Liberal opposition to nation-building projects and neatly illustrates how the LNP are bereft of vision or ideas. We saw the same objection to the rollout of telephone wires 100 years ago, or to the Snowy Mountains hydro-electric scheme. The inevitable cabinet reshuffle will be announced on Thursday, and it promises to oust Abbott’s strongest supporters such as Treasurer Joe Hockey and Finance Minister Mathias Cormann. Speculation abounds as to who will get what ministerial posts. One thing is for sure – Turnbull is going to have a job on his hands to make the LNP re-electable. After months of horrendous polling, many commentators are predicting a landslide towards Labor in the 2016 election. Let’s see if we make it there without another change of PM! 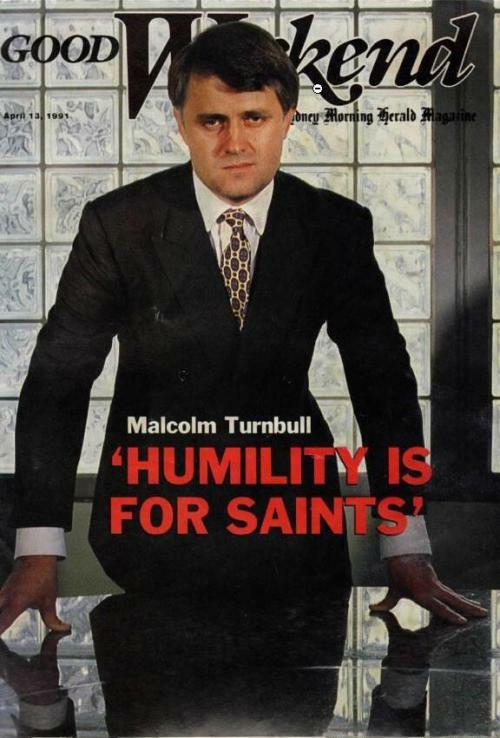 Here’s a choice pic of Turnbull in his younger days. It’s sure to be an interesting ride! Hi there! Apologies for the gap between articles, I’ve been busy. Yes…for nine years. I’m still pretty busy – busier than ever, in fact – but hopefully I’ll be able to churn out more than one piece between now and 2024. Probably as a result of me living here so long, but I’m afraid to say a few Aussie colloquialisms will undoubtedly pepper my writing. I’ve spent so long wearing thongs (flip-flops) that this column likely won’t be the most formal or sombre affair. Still, here we are. I’ll focus on current affairs, but I suppose a quick précis is in order before moving on. How to summarise the last near-decade in Australian politics? ‘Briefly!’ cry the wags in the audience. Okay, let’s cut a long story *extremely* short. Since my last post (2006?! ), Australia has changed governments a couple of times; in 2007, Labor’s Kevin Rudd defeated Australia’s longest-serving Prime Minister, John Howard of the Liberal-National coalition, Australia’s ‘small c’ conservatives. Rudd was then usurped by his Deputy Prime Minister, Julia Gillard, who challenged him for the leadership of the party in 2010 in an internal party spill. Rudd did not contest the challenge, and overnight Gillard became Australia’s first female Prime Minister. Also the first Welsh-born PM. Rumours that Bill Bailey caused Rudd’s downfall from his quip on 2010’s ‘Dandelion Mind’ that you can’t have a world leader called Kevin, are probably without substance. In June 2013, Rudd re-emerged from the back benches and, in a Game of Thrones- or House of Cards-esque manoeuvre, challenged Gillard for the leadership as she had done to him three years previously. He defeated Gillard and won back the leadership. Rudd called an election in September of the same year, but Labor was resoundingly defeated by the Liberal-Nation coalition, hungry for blood after six years in strident opposition. Rudd resigned in November 2013 and now lives in the US. Gillard also retired from politics, choosing not to contest her seat. I really am leaving out an awful lot of detail here, but it would take far more time than I, or you (the three people reading this) to go over everything that has happened over the years. 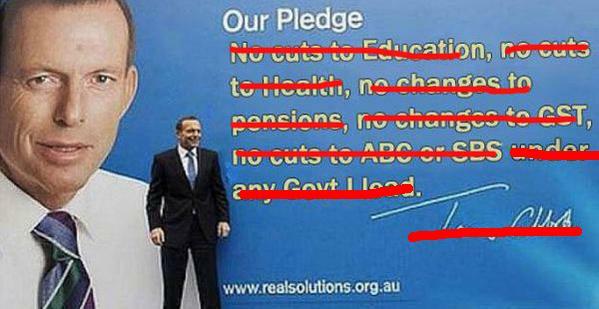 In 2013 the Liberal-National coalition once more took power, under the leadership of one Anthony John “Tony” Abbott. He is very much right wing and old school. A retrograde dinosaur, leading a cabal of science-decrying, climate change-denying, women- and minority-oppressing, big business-supporting buffoons who seem desperate to return Australia to the 1950s. Abbott was a rabid dog in opposition, hounding Rudd and especially Gillard with obstructionist manoeuvres and a contradictory mindset. He and the Liberal-National Party (forevermore here abbreviated to LNP) remind me very much of the Republican party in the US, whose main policy after the 2008 election was to prevent Obama from doing anything constructive. The LNP have few policies of substance; after 18 months in government they are still in electioneering mode – blaming Labor for perceived failings, espousing slogans over detailed policy, and not even paying lip service to the idea of compromise for the good of the country. Safe to say, I’m not a fan. Neither is anyone I talk to, which leaves me slightly baffled as to how they got into power. Labor certainly had their failings – the factionalism and in-fighting that plagued the party in recent years, combined with some poorly-executed policies and a dogged opposition no doubt contributed to their defeat. The less said about the mainstream media in this country, dominated as it is by Murdoch companies, the better (although I may well talk about that in future posts). The next election will likely be in 2016, and the feeling among my cohorts is that the LNP will be defeated. It’s an interesting time for Australian politics, and there is a lot to talk about. I’ll write about those issues most of interest to me, and hopefully more regularly that once per decade! Leaving school? Join the army! That’s the latest bizarre attempt by the Australian Government to boost flagging military numbers. Instead of taking a gap year and travelling the world, going to uni, or entering the workforce as school leavers currently do, Defence Minister Brendan Nelson this week urged students to don a uniform and serve in the Army, Air Force or Navy. I am quite disgusted by this move. It mirrors the current US Military’s recruitment program, where they send officers down to the poorest schools and try to entice young people with claims of travelling the world and being ‘paid to get an education’. Conveniently leaving out the whole getting-shot-at bit. But don’t worry, it’s not conscription. In the Sunday Age, Brendan Nelson said that although he “believed conscription was popular in the community,” this program is not “a move towards it”. I daren’t ask where he pulled that opinion from, but I think I can safely say that your average Aussie doesn’t think that mandatory military service is a good idea. It’s a shame, because many school leavers will be taking up the opportunity, subject to eighty days basic training and then dropped off in Basra or Kabul with a backpack and a gun. If they come back at all, more than likely it’ll be after a few years of being separated from their friends and family, and exposed to death on a daily basis for rotten pay. There are already mechanisms in place for people who want to join the military, let’s not target the most vulnerable and easily-swayed in order to expand the numbers, at the expense of the economy. MP Steven Pringle, deafeated Hawkesbury candidate for the governing Liberal party stood up in Parliament earlier this week and alleged that the party was “controlled by an exclusive sect, an extremist right-wing group”. I might just be hopelessly cynical, but I thought that was common knowledge. Pringle’s claims centre around the actions of upper house MP David Clarke, whom he dubbed the “Godfather”, for manipulating preselection campaigns. More specifically, the ousted candidate is referring to an investigation by The Australian newspaper, which revealed five hundred new party members being shunted into a Hawksebury ALP branch in order to skew the voting. Membership skulduggery has long been practiced, and reforms are being considered by the party’s state council in order to prevent such things. I’ll keep an eye on this in future weeks. Victorian Premier Steve Bracks yesterday promised to invest in stem cell research, even if the Federal Government votes to ban therapeutic cloning. This could be a considerable boost for the Victorian biotechnology industry, as the state holds some of the country’s eminent researchers in this area. California Governor Arnold Schwarzenegger recently invested $3billion into the area, and is reported to have created over two hundred thousand jobs in the sector. The mind boggles. Obviously, we’re not talking about the same scale here, but not only will there be economic benefits, but Victoria will be able to keep some of its top scientists here, and carry on doing sterling work in an amazing field. There will always be naysayers, and we need to await the vote on a private member’s bill later in the year, but I for one applaud Bracks for this decision. Don’t get me wrong, I still think the guy’s a slimy lunatic, but at least there will be winners all round if this latest policy comes to fruition. Hi all! After a brief hiatus, Downs Under has returned, and will continue to be a regular feature. The Australian Wheat Board funnelled $300m of kick-backs to Saddam Hussein’s regime a few years ago. This has been the subject of the Cole inquiry of late, and recent revelations have linked the AWB to terrorist plotting in Iraq. This could lead to executives of the AWB facing criminal charges. Attorney-General Philip Ruddock has been called on by opposition spokesmen to look into criminally charging those at the AWB responsible, for breaching anti-terror laws relating to the funding of terrorist organisations. We could quibble over whether a country’s regime constitutes a terrorist organisation, but I think we’d all agree that however one defines it, the acts described here are horrific enough to merit prosecution. It will be most interesting to see how aggressively Ruddock pursues this, given that there have been allegations in this inquiry about complicity from senior members of the Australian government in the scandal. Jack Thomas, the first Australian to be tried under anti-terror laws in this country has this week launched a new challenge to the control orders he was placed under. Given that his conviction was quashed, the federal court-imposed control order under which Mr Thomas was placed seem barbaric, and inherently unfair – something I have written about in previous columns. Director of the Terrorism and Law Project at the University of NSW Andrew Lynch contends that Thomas has a strong case, especially given that he was not represented in court at the time the control order was doled out. The test case is scheduled to proceed this December. I hope the decision goes in Mr Thomas’ favour. Otherwise, a dangerous precedent will have been set – that people can be subject to harsh punishment despite being convicted of no crime. Australia continues its march towards Orwellian dystopia. Following the refusal of classification from the Office of Film and Literature Classification, Melbourne University has removed Defence of the Muslim Lands and Join the Caravan from its shelves, lest it face prosecution for making the banned books available for staff or students. Ironically, both of those books are available on amazon.co.uk, and you get a discount buying both together. Shipping to Australia should take about five days. Everyone’s favourite illiberal Liberal tyrant Philip Ruddock submitted eight books for review/reclassification. His reason – they promoted terrorist acts. Not only is this move monumentally stupid, but it will have exactly the opposite effect from that intended. I may even buy the books myself now, where I didn’t even know of them previously. We’re going down a dangerous road when an institute of higher education is forced to remove controversial books from its shelves. I hear they’re preparing the bonfires already. Thanks for reading. If you would like to take part in TheCritique, either as a contributor or forum member, please head over to TheCritique Forums and sign up. The Bracks Government recently launched a legal bid to delay the release of information on Victorian projects until after the State election, due to take place on the 25th of November. The reports in question are assessments of major spending committments like a new freeway (Eastlink) and an enormous redevelopment of one of Melbourne’s main stations. I fail to see how Steve Bracks thinks that this latest legal manouvre can possibly make him look any better. The Freedom of Information Act request from Deputy Liberal Leader Louise Asher was initially turned down. After a lengthy tribunal process, access was finally granted, which prompted this latest challenge in the Supreme Court to stop the documents geting out. The official reason Bracks’ Government gave for turning down the initial request was that the records would include discussions that had taken place amongst cabinet members. As the state Ombudsman said in a recent report, there are well-founded concerns that government officials had in the past interfered, obfuscated and otherwise made the FoI process more difficult for people when it came to potentailly embarrassing or difficult issues. Personally I think this tactic will backfire when it comes to election time. Nobody likes their elected leaders to weasel out of their committments in such a blatant way, and Bracks is already in enough trouble with the electorate over his broken “No Tolls” promise for the new Eastlink freeway. One to watch out for in the next couple of months. Don’t agree with our values? Stay out. So comes the latest decree from opposition leader Kim Beazley, who is this week arguing that visitors and migrants should be forced to sign a statement saying they agree to follow Australian values, upon penalty of being denied entry to the country. Respect for Australia’s institutions, including its democracy, laws, courts, parliaments, armed forces and police, different religions and cultures, for the equal treatment of women, and for hard work. Hard work particularly tickles me, surely tourists didn’t come on holiday to work! Picture a collective rolling of the eyes, because that’s what many of the people I talked to about this did when discussing this issue. Beazley said the values of “respect for each other, mateship, fairness, freedom and respect for our laws are the front line in the struggle against extremists and terrorists”. Sadly, he did not elaborate on this. Mind you, in these days of sound-bite politics this is not entirely surprising. I would not be the first person to point out the ridiculousness of the idea that ticking a box on a visa form would somehow prevent terrorism. And what of Australians visiting other countries? Should they be expected to make a similar declaration when on holiday overseas? This is a patently-absurd proposal. All visitors and immigrants are subject to Australian laws, this should be enough. Relations between the Solomon Islands and Australia continue to fail this week, following the expulsion of high commissioner Patrick Cole. His crime? Consorting too much with opposition groups. For those not in the know, there were riots in the S.I. earlier in the year, and two allegedly corrupt politicans have been supported by Prime Minister Manasseh Sogavare in a commission set up to investigate the riots. The commission is generally regarded to be corrupt. Sogavare has outright refused to accept Patrick Cole back into the country, and appears unfazed by the threat of harsh visa conditions for Solomon Island diplomats. Foreign Minister Alexander Downer insists that any response from Australia will be commensurate to the actions of the Sogavare government. This will probably mean an end to diplomatic immunity and much tighter visa restrictions. Given that Australia has spent nearly a billion dollars over three years bringing peace, restoring law and order and otherwise supporting the Solomon Islands, it will be interesting to see how this latest stramash affects humanitarian efforts. At this point in time it seems neither side is willing to alter their position. “I think most farmers, particularly stud breeders, will go to extraordinary lengths for their animals.” Indeed. Please sign up to TheCritique forums. If you’re interested in writing for us, just sign up and drop us a line! The Age, 2/10/05 – Islamic Council of Victoria Condemning latest Bali bombings or in 2002, the Islamic Council of NSW condemning the first Bali attacks (pdf). I found a great article this morning on Islamic Sydney’s website by lawyer Irfan Yusuf. He makes some very interesting points, but the overriding message I took away is that the vast majority of Muslims in Australia are already integrated, and that Howard and Costello’s recent exhortations are completely out of proportion – not to mention insulting. Leaving that aside for the moment, what would happen if spokesmen for the Muslim community were to unleash an advertising barrage of unequivocal condemnation of terrorism? TV commercials, newspaper adverts, billboards etc. What would the net result be? I’m not sure that it would achieve much, if anything. Terrorists are terrorists; they’re not going to be swayed by moderate Muslims being more outspoken than they already are. Condemnation from general society certainly hasn’t done much to dissuade them. The government and other commentators do Islam a disservice by not recognising that it is as divided and diverse as Christianity. Our favourite (read: only) Attorney-General Philip Ruddock continued to do his part in promoting terrorism this week, claiming that Australians need to be more afraid of it. Isn’t that great? Apparently we’re far too complacent. Okay, well let’s see what he said to the Ten Network when questioned on just what it is we’ve to be so afraid of. “I think what we’re seeing in the United Kingdom is that there are numbers of groups who it is believed are intent on carrying out terrorist attacks,” he said. I’m aghast, this is blatant fearmongering; I mean he’s not even trying to disguise the fact that he’s basing this on no information whatsoever. I know I don’t need to tell our esteemed readers that the raison d’etre of terrorism is to strike fear into people. Why on earth would Ruddock try and do Osama Bin Laden’s work for him? Today (Monday, Sep 4th) saw the coming together of 2500 experts for the International Congress on Obesity. It’s no revelation that this is a growing problem in Australia, but it is being reported that some patients are being denied surgery in case they die under anaesthetic. The Australian and New Zealand College of Anaesthetists has written to the government urging that action be taken to combat obesity. Their recommended changes appear fairly sensible: more activity in school, better food, regulating junk food advertising to children etc. I think it’s sad that the government has to legislate common sense, but then we’ve seen that education has only had so much of an effect. One key point there is the lack of facilities. Newer suburbs simply provide no other way for people to get to work than driving, even driving to a station. If all there is in walking distance is more houses, children are just going to stay at home playing computer games. Now, I know that will have got a grin out of a couple of TC readers (Naselus, HStorm) – because we did a lot of that growing up (still do!). It was always balanced with a lot of walking and larking about town, though. Growing up we had a lot of fields and parks; shops were in walking distance, as was the shore. As more and more news comes in about the rising obesity epidemic, it seems clear that something has to be done. It also motivates me to keep going to the gym. Bit of a sad story to end on this week. Steve Irwin, known to millions as the Crocodile Hunter has died from a Stingray bite. This was really unexpected and pretty saddening, but I think it’s some consolation that the man passed away doing what he loved. Our thoughts and condolences to his family. CORRECTION: Reader Hueber has called in to clarify an error. Rather than a bite, the barb from a Stingray pierced Steve Irwin’s heart and killed him. More here in The Age. Please consider joining TheCritique forums. We are always looking for new members and article contributions. I love deadlines, especially the whooshing sound they make as they go past. Hi folks, sorry for the delay in this week’s – well, last week’s column. I had a very busy weekend. Anyway, are you sitting comfortably? Let us begin. Health Minister Tony Abbott this week asserted the rightness of the religious reasoning behind his policies. Which is to be, Tony? It will be interesting to see if the Health Minister alters his stance on embryonic stem cell research given the recent news that scientists have found a way to conduct experiments without destroying embryos. Despite his conviction being quashed by an appeals court, terrorist suspect Jack Thomas now faces severe restrictions on his daily life. Retribution from the Australian Federal Police perhaps? Possibly. Mr Thomas now has to report to police three times a week, obey a strict curfew, and cannot even use any telephone that has not been approved (read: bugged) by the AFP. I laughed when I read that he has been specifically forbidden from contacting Osama Bin Laden. Yes, that’s likely to happen! Now, I’m often accused of being a terrorist sympathiser (mostly by morons on The Age’s Your Say blog), but the way I see it is this: If a court of law has quashed your convictions, and you’ve not actually committed a terrorist act, you’re innocent and should be free to go about your daily life. I don’t see that as unreasonable, because it’s a principle that can be universally applied. The most laughable thing about this is the justification for his continued punishment. Consider these quotes from the police and Philip Ruddock. Sorry, lame joke. Following on from last week’s item on obesity, The Age is reporting on a new State government report which claims that surgery is a cost-effective method to try to tackle childhood obesity levels, which, like their waistlines, are expanding all the time. The report also recommends restrictions on advertising junk food to children, but Health Minister Bronwyn Pike seems not to be trumpeting that too loudly. Goodness knows why not; I think it would be far more sensible to take practical measures to curb obesity before we consider putting children under the knife. Gastric band surgery is often used as a last resort tactic for morbidly obese adults. It’s a drastic procedure, not without risks. Cambridge Energy Research Associates have forecast a fall in the price of crude oil to $50 a barrell. John Howard and senior economists have jumped on this prediction to assure us that petrol will go back down to $1.15 a litre by Christmas. Production is set to grow by 25% in the next 9 years or so, and Howard promises – though with a tinge of caution – that by the end of the year we’ll have seen the end of high petrol prices. I’ll believe it when I see it. What confuses me, and perhaps someone would enlighten me (join the forums!) is that analysts are saying that high prices will lead to a drop in demand, and so prices will drop down again. Surely this will bring demand back up and we will be back to square one? Okay, there’s not much nonsense going on in Australia right now, apart from the usual political spin, so I’m going to render this section an “irregular feature”. Thanks for your attention, and please do join up the forums and submit your article ideas. Writers are always welcome.